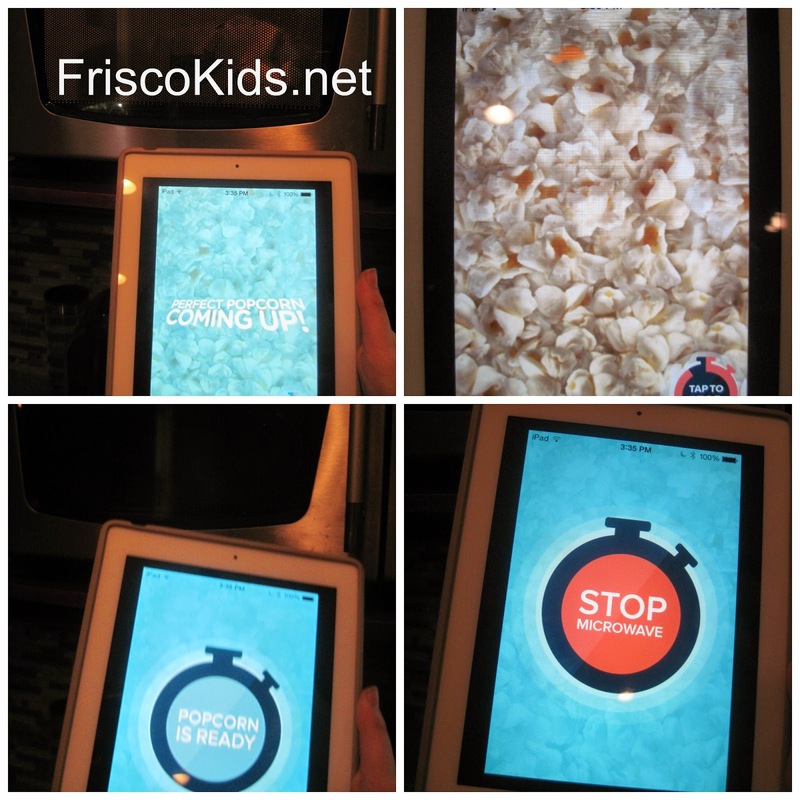 My daughter heard about the Pop Secret Perfect Pop popcorn app a few weeks back, and she thought it was something I should post on my other blog, Stupid Products. Do you love my back splash? 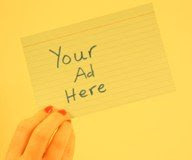 So when Pop Secret asked me to do a sponsored post testing its Perfect Pop app, I had to say yes. I'm really doing for the entertainment value - and some quality time with my daughter. Plus we created a scientifically valid experiment out of it, which made it educational as well. If you haven't heard of this app, it's free. 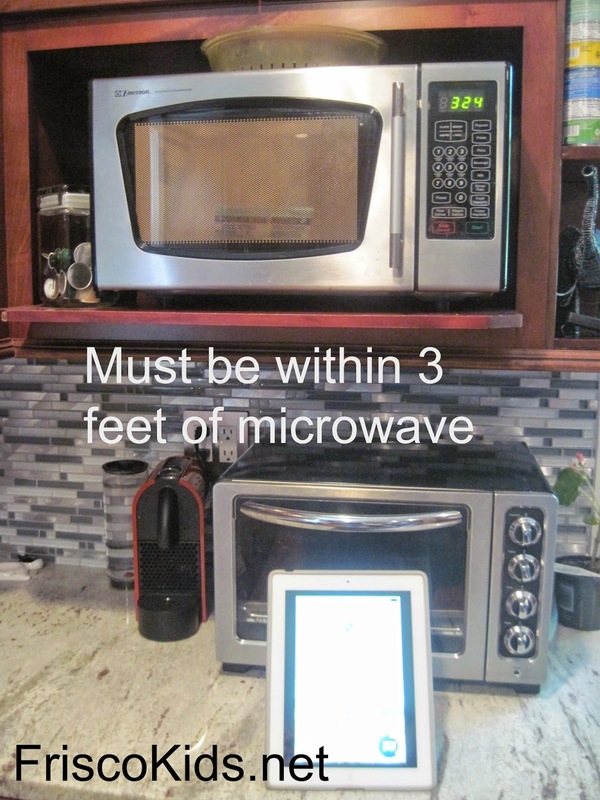 You open the app, and put your iPhone or iPad within 3 feet of the microwave. Then you set the timer to whatever it says is the ideal popping time on the box and start popping your popcorn. It listens to the popping sounds and tells you when it's done, so you avoid burning your popcorn and smelling up your house. But what fun is it to only test out the app with Pop Secret? We did test the app out on two competitors, and I'll have results for you later. You should definitely read on because the results were surprising. Above is an official, original photo of my iPad within three feet of the microwave, as my Pop Secret bag 'o popcorn pops. I set the microwave for 4 minutes (instead of our popcorn setting) to see what happened. The app has some fun movie-related trivia bits you can read while the popcorn cooks and it has some graphics showing popcorn filling up in the bag on the screen. It tells you when it's almost done and then when to stop the microwave. You do have to pay attention because the app doesn't make noise, but you do have to increase your device volume so it can hear the popcorn. The results? We were happy to see that the popcorn was not burned, and looked white and fluffy, without a lot of unpopped popcorn. Success! Do you like my artistic original photo, and my popcorn bowl too? My mom gave that to me. 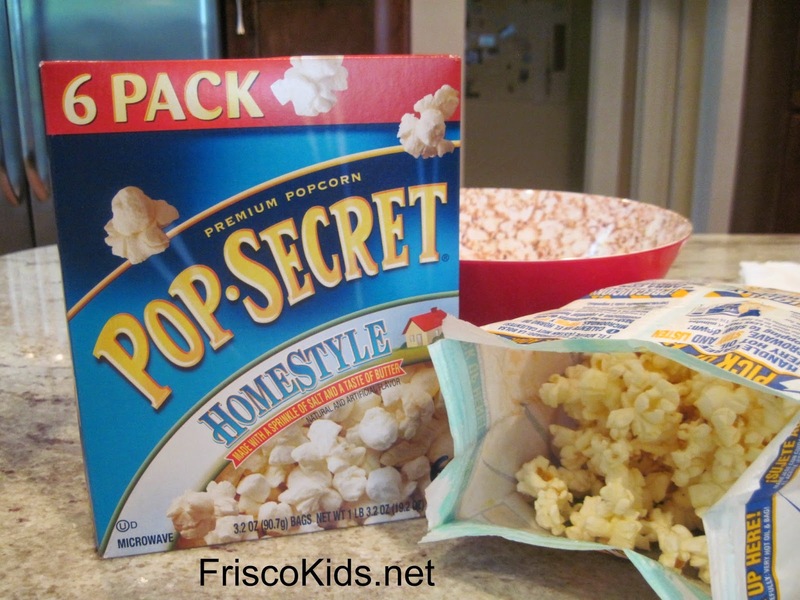 The Pop Secret people say that the app works best on most of their flavors, except kettle corn or sweet and crunch. My daughter and I then had some discussions about whether this app would work on competitor brands. If the app only listened to the popcorn popping, wouldn't it work on all brands? 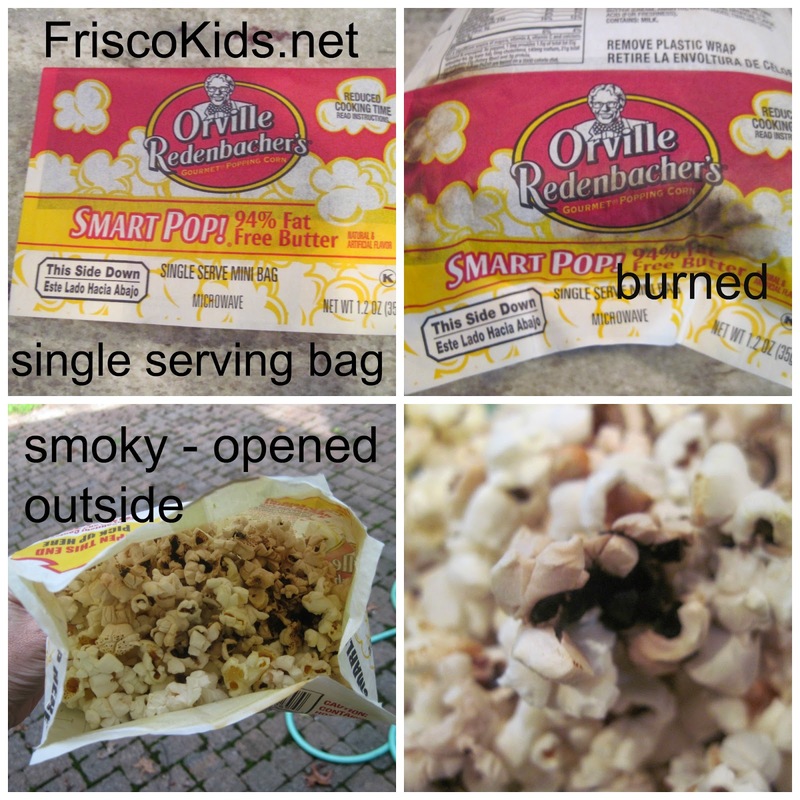 So we first tried a single serving bag of Orville Redenbacher brand, which was a low fat variety. There is an app setting for single serving bags, and I set the microwave for 3 minutes, which is about 1.5 minutes longer than I usually cook these single serving bags. Turns out you're supposed to set the timer for the normal time of the bag, so I goofed on that one. But the app kept that bag popping almost the entire 3 minutes, at which point I had to take the bag outside to open it, because it was burned and smelly. 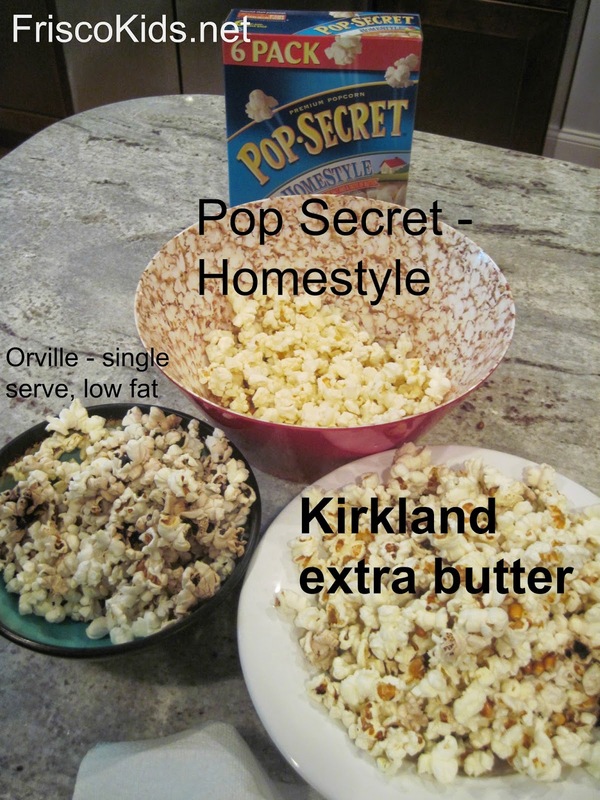 I then tried the app on a regular Kirkland (Costco) brand serving size bag (3 portions) of the same general style of the Pop Secret popcorn we used - lots of fat, basically. I set the timer for 4 minutes, just as I did with Pop Secret, and the app told me to take the bag out after 3 minutes. 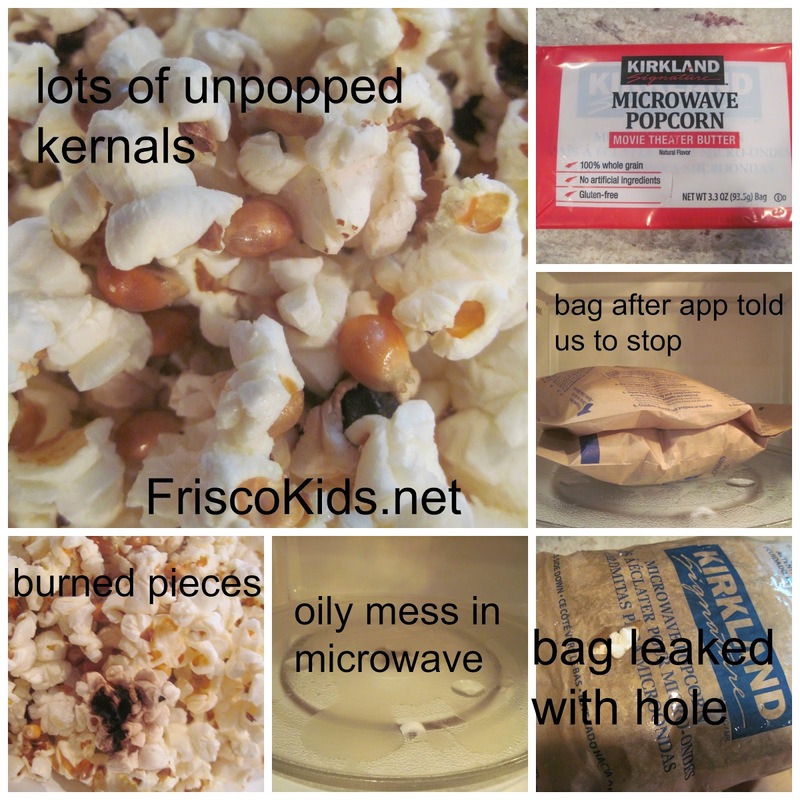 The bag was only partially inflated and many many kernels were unpopped. However the bag had a hole in it and the grease leaked out all over my microwave. Disgusting! And some of the popcorn was burned. #fail. So from our trial of 3 brands of popcorn, the Pop Secret Perfect Pop app worked fabulously well on the brand it was made for, and not well at all on competitor brands, which defeated my original hypothesis that it would work well on any bag. And I was surprised how much better the Pop Secret looked than the other brands. I didn't think there would really be a difference. (Post script - the next bag of Pop Secret I tried burned just like the competitors. I'll have to try again to figure out what happened, once I get a new microwave, since mine died. But not because of popcorn). What a great popcorn! I never would have thought they have an ap! I like the idea of movie trivia while I wait for my popcorn. Thanks. Sounds like a cool idea! I'll have to check it out!